Fiskars x27 Splitting Axe Review - Is This Worth the Money? Fiskars X27 Splitting Axe Review – How Useful Is This? For the past year, I had been looking for a good wood-splitting ax that combined versatility with performance. After doing some research, I discovered the Fiskars x27 Splitting Axe, which is designed primarily to chop logs. I’ll admit when I initially saw the design of the ax I was skeptical. Over the past several years, I had been using axes that were longer, thicker, and somewhat bulkier because I believed the added weight assisted in chopping wood. However, I did read some good reviews of the ax and decided to give it a try. What follows is my experience with the ax over a three-week period when I chopped a considerable amount of wood, including logs that ranged from about 6” to 18” thick. At just around $50, I was actually impressed with the low price of X27. Most axes that I have purchased before reached into the $100 range and beyond because I was looking for high-quality. Admittedly, I almost passed on buying this particular ax because it was priced so low relatively speaking. I was only the recommendations that convinced me to take a chance with this ax. 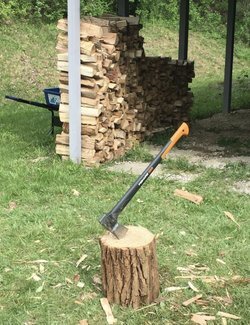 Arguably the most unique feature of this ax is how it strikes the wood. With most axes, the power is in the downswing which gives the weight of the blade is enough to penetrate the wood. However, this ax is more akin to an aluminum baseball bat. This meant that I had to adjust accordingly to put more effort into the overall arc of the swing and not just focus on the last few feet. Admittedly, it took some time to get it right, but once I did it was easier to penetrate the wood and break up the logs. On average, it took me one to two less swings compared to my previous axes and I use less effort as well. It’s not just the elongated handle and relatively short blade, but the angle of the blade that is strikingly different about this ax. Because of the slight downward angle, it seems to give less room for error when striking. However, I noticed that once I mastered the proper swing, I was able to generate more force to the blade itself. While it seemed counterintuitive at first, I do believe the design of the ax adds to the power and force that can be delivered. The unique shape and size of the handle make it easier to swing, once you get in some practice. Because of the length and striking power of the ax, you can strike harder and deeper compared to similar axes. Plus, I found myself using less effort thanks to the unique design which is more like a baseball bat than a traditional ax. Admittedly, it took me more swings than I thought was needed to get used to how the Fiskars X27 strikes the wood. Once I learned, it became fairly easy to split medium to even large-size logs. Plus, if you are taller, it certainly helps in wielding the ax. A word of warning, while this super splitting ax offers a lot of positive features, it does take time to get used to the design. While I have not been injured using this axe, I can see why some people may be vulnerable if they do not learn how to swing it properly. The danger comes from treating this ax like standard axes that require more heft and power. If you swing too hard or apply too much force, you can lose control of the ax and even risk having it bounce off the wood and into your body if you are not careful. That’s because the design itself is really more like a bat than an ax, so you will need to take it easy for the first several swings until you start to get the feel of how it works. 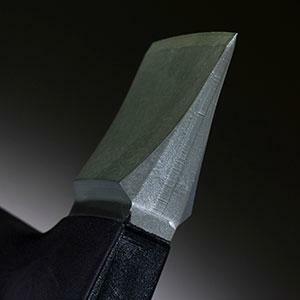 Another danger is the potential for the ax blade itself to chip when striking a hard object inside the wood. While I have not personally seen this happen, I have read some reports of nicks, chips, and dents in the blade after it struck wood that had imbedded metal objects such as nails and the like. While I take such warnings with a grain of salt given my experience with the ax so far, I feel it is necessary to warn you of the possibility that chipping might occur. So, be sure to wear the proper safety goggles when chopping with this ax. Overall, the Fiskars x27 Splitting Axe has really impressed me thanks to its overall construction, performance, and durability. Once I got used to the proper swing, I’ve been able to chop more wood in less time and with less effort. I’m really glad I took the time to perfect my swing because the results have been quite impressive. 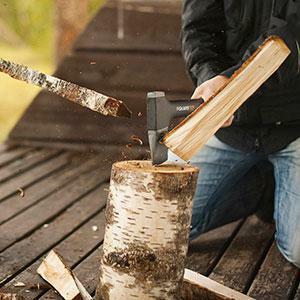 My recommendation based on my experience with the ax is that you should purchase it if you split logs frequently. For those who split logs up to 18” in circumference, then this is the ax for you. Also, if you are at least average height or above, this ax will deliver a solid, consistent performance. If you are shorter, you may need a little more practice swinging the ax or getting another one depending on your height. However, I strongly recommend the Fiskars x27 Splitting Axe for most people who are frequently splitting logs for firewood.